A little more than a year ago, Lucy MacLeod watched a YouTube video that changed her life. Within weeks at Dalhousie University she launched a chapter of a group that makes period products available to those who need them. A little more than a year ago, Lucy MacLeod watched a YouTube video that changed her life. It was about an American non-profit organization started by a teen who, during a bout of homelessness, became aware of the need for homeless people to have access to menstrual products, and the unsanitary items they'd use — toilet paper, socks and brown paper bags. MacLeod, a 23-year-old from Dartmouth, N.S., said that while there are many inspirational videos on YouTube, this one hit home. "It just sparked that, 'Wow! I never thought about that before. Maybe this is something I should look into,'" said MacLeod, who graduated from Dalhousie last year with a psychology degree and intends to begin her masters later this year at the university. The American organization, PERIOD. The Menstrual Movement, has chapters worldwide devoted to making period products available to those who need them. The organization also advocates for making the products free and accessible at public school washrooms. MacLeod was so inspired by the work of PERIOD that she got in touch with the organization and started a chapter at Dalhousie early last year, making it the first chapter in the Maritimes. At the same time, another Dalhousie student, Claire Sethuram, was looking to set up a chapter, so they joined forces. "The overall idea is that menstrual hygiene is a right and not a privilege," said MacLeod. 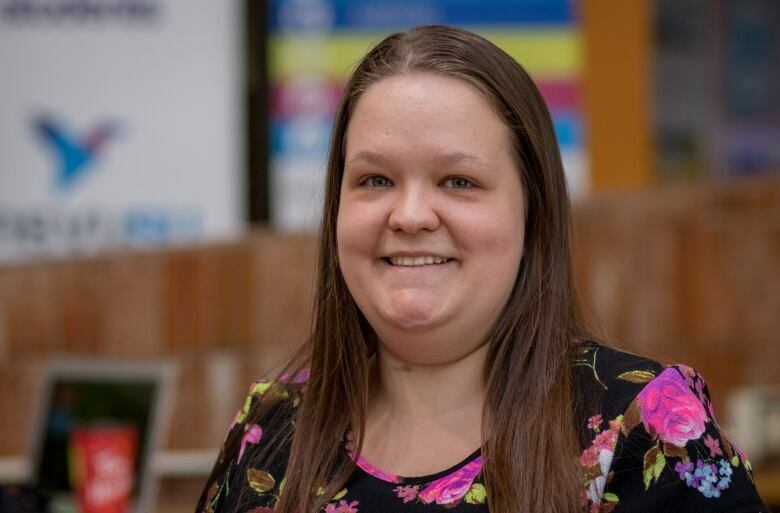 She's so passionate about the group's work that she continues to serve as co-president of the Dalhousie group even though she's not currently a student. "We were just starting to lay down the foundation for an awesome initiative and I didn't really want to stop there," said MacLeod. The group holds fundraisers — bake sales, exercise classes, open-mic nights and painting events — to raise money to purchase menstrual products. To date, the group has raised enough money to purchase 15,000 products, said MacLeod. "We use a paper bag and we stamp the paper bag with a stamp that says 'PERIOD. The Menstrual Movement' just so when we close up the bag, nobody forgets what's inside and it has nine tampons and six pads,' said MacLeod. "And we also include a little note, 'Just have a great week. You got this' or maybe something funny like 'Don't let this cramp your style.'" The group focused on providing homeless products to people in shelters because the Dalhousie Student Union provides menstrual products to students. The group donates the items to a women's shelter, Barry House. Dalhousie isn't the only Nova Scotia campus where menstrual products are provided to students. At Mount Saint Vincent University, the administration started doing so last year after lobbying from the student union, who equate the need for period products to that of having toilet paper and paper towel in a washroom. "When you go to the bathroom and you wash your hands, you're going to need soap. It's a necessity ... we don't choose to menstruate. 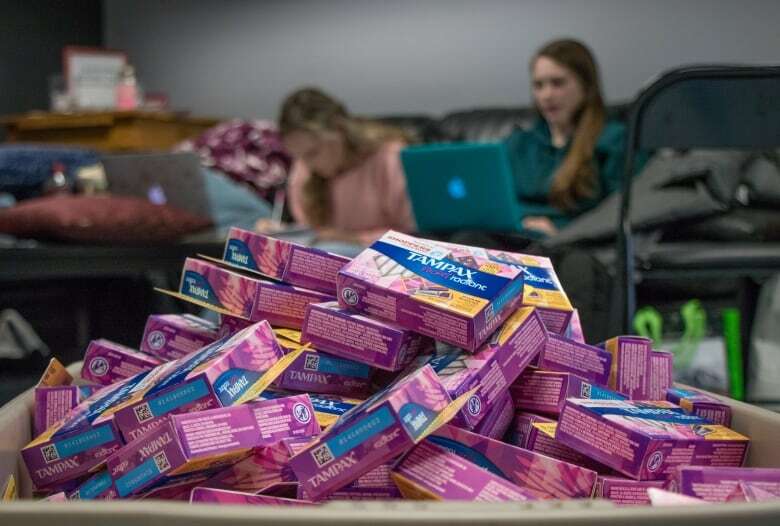 We don't choose when we're going to menstruate or how much we're going to menstruate," said Madeline Mitchell, the vice-president of advocacy for the Mount Saint Vincent University Students' Union. "It's simply a product that is essential to our well-being." Advocates at universities and colleges across Canada have for some time been calling for free pads and tampons for menstruating students. It was only about 3½ years ago that the Canadian government eliminated the GST on menstrual products. Since 2010, there hasn't been a tax for these products on the provincial portion of the HST in Nova Scotia. 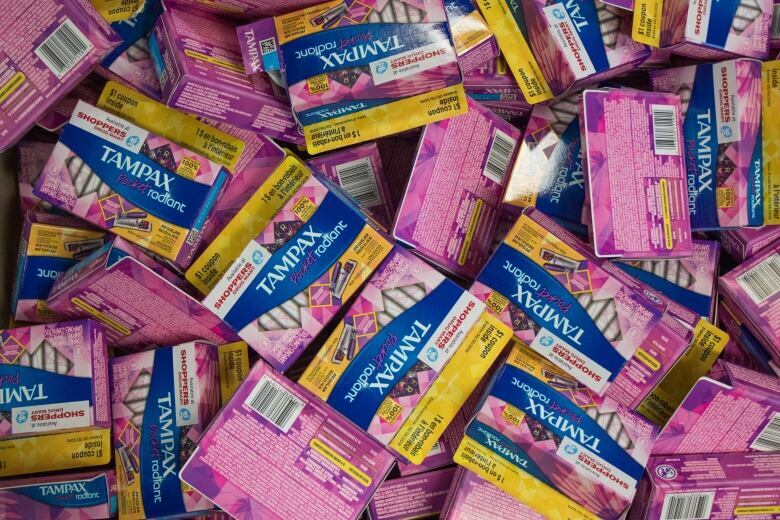 Mitchell said she thinks there's a reason why the free menstrual product movement is gaining momentum at Nova Scotia universities. "To see students being the ones leading the charge, it's not surprising to me," she said. "You know, we have come to learn as young people that things are not going to be provided for us. The world is not the happy, friendly place we were taught it was when we were kids and if we want something, we have to fight for it."